.world of WIZ....: The US of A! PART 2 - Bishop. The US of A! PART 2 - Bishop. During our time in Hueco we had met and made friends with many people and i noticed that they all had at least one thing in common apart from climbing. They all said that during our time in the US we had to make it out to Bishop. Another world class bouldering spot known for its high balls and many say it is better than Hueco... (this may be judged on the fact it has no rules etc). I always had it the back of my head that during our trip we might be lucky enough to go check out other areas and it was coming close to the end of our time in the states and the thought of being able to get to anywhere else had not even crossed our minds. We felt like tiny little ants being in the land of America with no form of transport so the thought of traveling across states was madness! This all changed after receiving a very unexpected but exciting message via 'The Facebook'. It was from a very good friend of ours who we had met earlier on in our trip in Hueco, his name was Jeremy. He said that he had come up with an idea on how to get our poor asses to bishop by simply paying for mine and Isaac's flight to Oakland then he would drive us up to Bishop and climb with us every weekend. How rad is that!!! We both were very excited about this offer and after a bit of thinking (thinking is bad for you) we could not think of a reason not to so jumped at the opportunity and began organizing. It was hard leaving Hueco as it had been our home for the past two months and we had made many great friends but we had heard a lot about Bishop and felt like a change in scenery would really do good for our climbing. Wiz Fineron enjoying the classics of the Buttermilk's. Awesome V5 arete. By the time we arrived in Bishop we had about just over two weeks an till our flight left for home so we immediately began ticking off some of the classics. On our first day Jeremy showed us around some great problems and we ended up sending three V9s including my first flash of the grade which was Soul Slinger. The other two were called Twin Cracks and The Fall Guy. I really enjoyed the climbing style here as it was a lot about technique and not so much power which matched my style well. It was crazy seeing all this chalk on what looked like nothing of a hold but as we learned during our time there if you get your body in to the right position and pull/push on the hold in the right direction you would be able to hold on to what looks like nothing. This is due to the amazing friction here in Bishop. Most of the time it is your friend but don't get me wrong, it will attack! After spending a few days running around doing some of the classics we decided to have a crack at some of the problems on our tick-list. First up was Evilution V11. 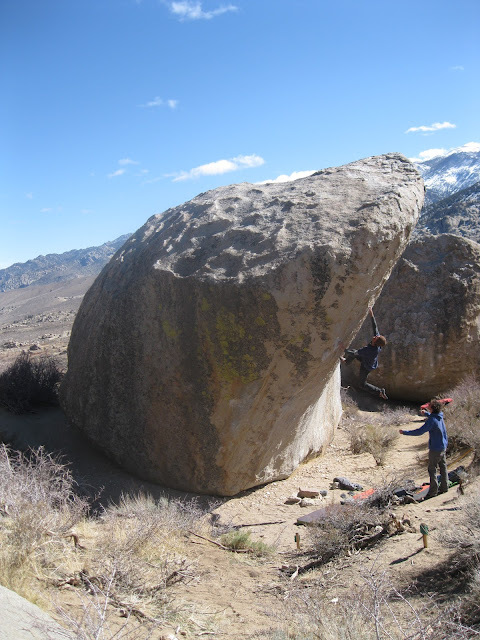 An awesome high ball classic on one of the largest boulders iv ever seen. Unfortunately i was shut down quicker than expected and after many attempts i still couldn't do the first move. I found this a little frustrating but later found out that the same move stumps many people which made feel a little better but i was still determined to return and make some progress on it. Isaac on the other hand was doing real well. Sticking the first move consistently and getting high enough to get scared. We returned a few times and he was doing good but a combination of hard moves and fear stumped him a few moves higher. Me, i was still stuck on the bloody first move. Next up was 'The Mandala' one of the most beautiful lines i have ever seen and i would do anything to return and do this problem. Again the first move was really hard but i managed to get through it eventually and began working on the moves higher up. After a few working sessions we had made some good progress with only the last long move towards the top to go and i felt like it could definitely go but needed some work. This is when we began to notice how tired we were mentally after going three months straight projecting problem after problem. Standing beneath one of the most iconic boulder problems ever and were struggling to find that extra psyche that we needed. What was going on? After three months of solid hard bouldering we found our selves hit rock bottom with no mental or physical strength needed to project hard boulder problems. After a long and well thought decision we decided to take a step back and set our selves a goal. To try and do 30 or more boulder problems above grade V6 in the ten days or so climbing in Bishop. This was also good as i needed one more V10 to achieve my goal of 10 V10s. Wiz Fineron on Sharma Traverse V10, Bishop. We spent our last five or so days climbing all day and almost everyday, jumping on anything that looked fun and with not a worry in the world about weather we sent it or not. Doing this we felt much happier and felt like we climbed much better with out any pressure. 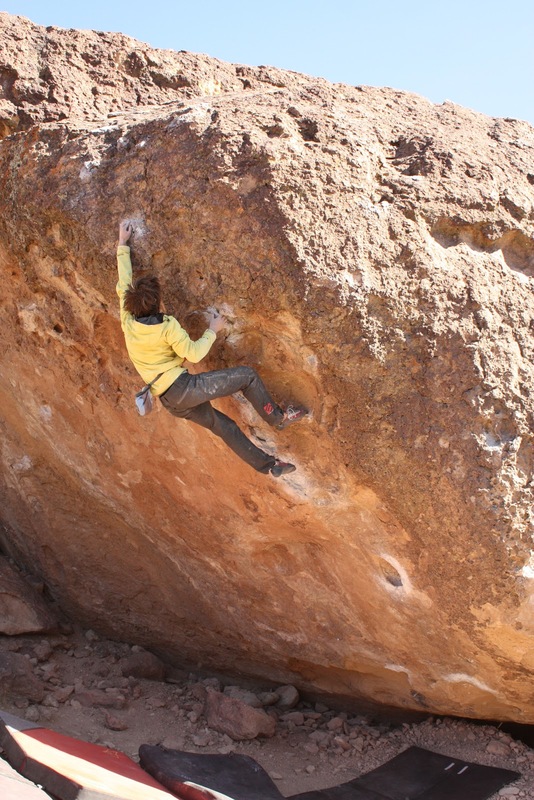 During my last three days climbing i ended doing five more V10s starting with Redrum sit (Happys) then Acid Wash (also in the happys). The following day we returned back to the freezing cold Buttermilks and i managed to push through the pain and send Bubba Gump which i was happy about but couldn't even think about climbing something else as my fingers were so sore. Our trip was just about over so after packing up we drove down to the Sad boulders for our last few ours of climbing in the states. I enjoyed the Happy and Sad boulders but i have to say they are nothing compared to the Buttermilks. 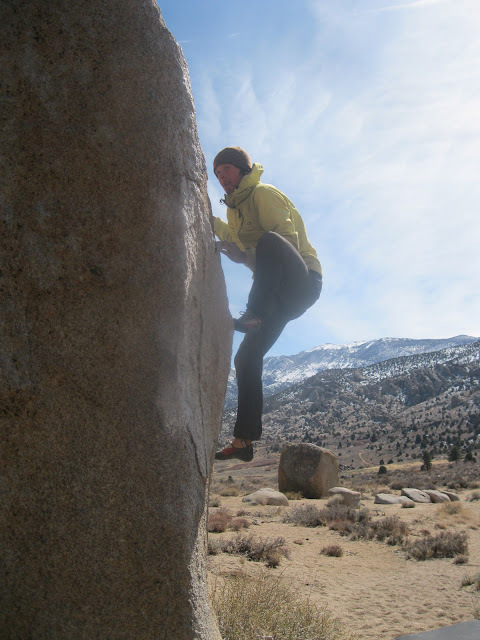 Wiz Fineron enjoying the classic V5 at the Sad boulders on the last day. We spent most of our day in the Ice Caves trying fun problem called Beefcake V10 which started off feeling really hard but after a while working it out it i finally got it. The hardest bit was trying not to dab on the ground and on the wall behind me. This secured my 30 boulders above V6 but i carried on climbing for the rest of the day aiming to have no skin left by the time we left. I have always liked the feeling of leaving an area knowing that you gave it all you had. I then jumped on this problem called Aquatic Hitchhiker, another V10 on the other side of the Ice Cave. It was a very short problem with a really high heel hook at the start, it looked fun so i went for it. A few seconds later i was at the top... "What the....?" "flash?" really...? This was my first V10 flash but i still couldn't understand how... I ended up jumping back on it to show the beta and managed to do it again straight away... Just one of those problems i guess. Full ticklist of our short time here in Bishop. Just like to say another huge thanks to Jeremy for all his help during our time here, it really made our trip. :) I am sure we will run in to each other somewhere down the line.